Maura Del Serra, Ladder of Oaths, Trans. by Dominic Siracusa, Contra Mundum Press, 2016. Maura Del Serra is a poet, playwright, translator, and essayist whose work is highly regarded in Italy and Europe where it has garnered numerous accolades. Following her anthology Coral (1994) and the critically acclaimed collections of poetry L’opera del vento (2006) and Tentativi di certezza (2010), Ladder of Oaths contains poems and other texts Del Serra composed between 2010 and 2015. 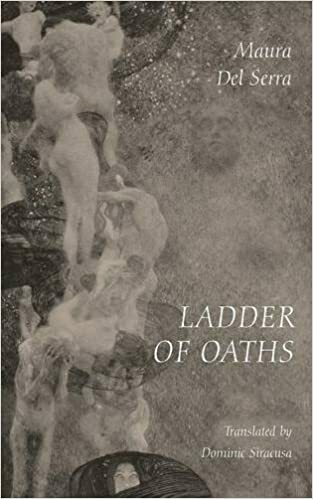 Ladder of Oaths further develops and enriches the author’s ars poetica — while rooted in classical Western & Eastern traditions, Del Serra’s spiral-like gaze extends from cosmo-metaphysical openings to both autobiographical & civic themes. The architectural and polytonal character of her poetry is born of more than three decades of intense and convergent activity as a writer who embodies the multiple nuclei of a thinking poetry. Maura Del Serra, Infinite Present, Trans. by Emanuel Di Pasquale and Michael Palma, Bordighera Press, 2002. The work of Maura Del Sera, poet, literary critic, translator, and playwright, has been translated into German, English, French, Catalan, Portuguese, Russian, and Swedish. In this collection of poetry veteran translators Di Pasquale and Palma maintain a lovely consistency as they alternate poems. "I have always been moved by obstinate grass tufts/ bursting through walls and asphalt,/ children of stone and air, and only of a memory, earth longing" - from Road Grass. In 1963, I made a pilgrimage to Gerde's Folk City, in New York City, to hear the young Bob Dylan. He was beautiful, sweet?faced, curly?haired, angelic, yet he sang of simple truths ? of human suffering, of the struggle for freedom, of the need for love. He seemed to narrow the gap between the spirit and the real. The classic (and Classical) Italian poet Maura Del Serra closes the gap between the spirit and the real in her poems, whose imagery, full of light, fuses (while contrasting) the dream and the fact. In prayer?like songs, she celebrates the simplest things: "the earth?polished bone, / the hundred?year?old lock of hair, / the rusty knife. [...]"
Del Serra's work is full of faith and respect for life, for that which is life?giving. Her poetry is sensuous and bright. It is also dramatic, recalling ancient Greek plays: "'Serve the spirit / of the creator, your planet, mother earth, / all the beings in whom you see yourself' [...] / To serve [...] / scorching rock that trips pride ? / to serve, return, touchstone that guides all the mind's / frontiers, sensible, exemplary rock". In a reversal of the usual experience, I met Maura Del Serra in person before I encountered her work on the page. We met in Charleston, South Carolina, in October 1997, at the first annual conference of the Italian Poetry Society of America, where what I heard and saw of her poetry immediately created in me a desire to translate it. Incredibly enough, only two or three days after the conference, we encountered one another again in front of Saint Patrick's Cathedral in New York. I ascribed to serendipity what another might have called the hand of fate, but the recrossing of our paths impressed me enough to make me feel that there might be some validity to the crossing of our poetic paths as well. Del Serra's work has deepened from volume to volume in both craft and sensibility, but has remained constant in its dedication to brief, concentrated forms. Her poetry maintains the precision and the intensity demanded by such focus, and is further enriched by her seriousness and her range of interests, among them the domestic, the mystic, and the mythic (as well as the mythmakers: her poems on writers and other artists, with their often amazing images and leaps, are among my particular favorites). I met Maura Del Serra in 1997, on the occasion of a poetry symposium in Charleston, South Carolina. Recently, I spent a couple of days with her in her native Pistoia, Tuscany, and on that occasion we examined together her first book in English translation. Infinite Present is a handsorne volume recently published by Bordighera Inc. in dual language edition, featuring a selection of Del Serra's poems from several books of her poetry. The translators, Michael Palma and Emanuel Di Pasquale, have not translated together, but have each selected a group of poems to translate. I applaud this decision. The selected poems come from L'arco (1978); La gloria oscura (1982); Concordanze (1985); Meridiana (1987); Infinito presente (1992); L'età che non dà ombra (1997); and Adagio con fuoco (1999). This selection shows the arc of Del Serra's itinerary from her poetic beginnings to the present. Maura Del Serra was born in Pistoia in 1948 and is the author of seven collections of poetry, as well as a book of collected poems, Corale (1994). She has published seven books of literary criticism, the most recent of which is Di poesia e d'altro (2000). She has contributed to numerous reviews and journals, and her poetry has appeared in several anthologies. She teaches Comparative Literature at the University of Florence, and lives in her native Pistoia with her supportive husband Moreno in a lovely house crammed with paintings and books. Maura Del Serra is a translator in her own right, and has translated into Italian the works of Else Lasker-Schüler, Marcel Proust, William Shakespeare, Virginia Woolf, Katherine Mansfield, Simone Weil, Jorge Luis Borges, and many others. She is a playwriter as well as a poet, having authored many dramatic pieces, such as La Minima; L'albero delle parole, La Fenice, La fonte ardente, Specchio doppio, Agnodice, Eraclito, and the recent Dialogo di Natura e Anima and L'atto di Pasolini. Her love for the theatre imparts a dramatic tone to her poetry and some of her poems may sound like a soliloquy. Her background is essentially classic and her work echoes classical drama. Maura Del Serra's poetry has the quality of the poet herself: a delicate formal beauty matched by depth and strength of thought. It presents some elements of hermetic poetry - the same compactness, the same intricate and sinuous syntax reading. Del Serra's poetry does not come towards the reader, in the manner of contemporary American poetry; rather, it beckons to the reader to come forth, to unearth secret enclosed in it, by flashing the possibility of an epiphany. There is no doubt that Del Serra's poetry is erudite. It contains numerous references to classical concepts, as well as a great cultural latitude. Famous Italian critic Bàrberi Squarotti perceptively emphasized the "disposizione al discorso" (discoursive predisposition) that characterizes Del Serra's poetry. It is such disposition that enables the poet to communicate. The critic further describes Del Serra's poetry as a "slancio luminoso [...] tra l'ammonitorio e il consolatorio", since the "élan" of her verses jolts the reader into an acceptance of reality that only poetry predicates. The "sentenziale" (sentence-like) quality of Del Serra's poetry identified by Bàrberi Squarotti goes also hand-in-hand with great simplicity of style when the poet describes nature: nature is seen not only as a miracle to behold and to live in, but also as the ultimate bearer of wisdom and the supreme healer. Rhytm is very important in Del Serra's poetry, and I agree with Bàrberi Squarotti's notion that Del Serra's verses are essentially hendecasyllabic. In Infinite Present the translators have attempted to the original verse, since they could not possibly preserve the "sound". I will cite from a couple of poems that appealed to me in a special way. Here is a poem about "Ravello", the wonderful town on the Amalfi coastline, translated by E. Di Pasquale. "Mutable, lasting like the sun on water, / the days spins on its reborn sky, / on towers cleft on hills, on the reefs / where the stone has the color / of house wood, on an Amalfitano pine / which, parallel to the sea, / breaks a gate with its trunk. And here, for an hour / hurled at time without time, we are / the silent struggle between the flower and the leaves / of the walled-up almond tree". And here is a portion of Aztec Song, inspired by Pre-Columbian lyric, in M. Palma's translation. "With a noose of emeralds, I, weaver of songs, / bind the impassive arrow of the sun / to the brittle grass of my destiny, / I filter the gold in the cracked amphora, I measure / my pathway with the dust of sonorous blood, / my end with druken lamentation, an ending sealed / in sacreds books and on barbarian words: / I paint our Kingdom on the plumes of verse..."
In Del Serra's lyric we can find echoes of western metafisical poetry, of the classics, as well as references and allusions to the Bible and to Dante. Since Del Serra's poetry is essentially visionary, there is also a kinship with the poetry of the Imagiste poets. Further, Del Serra has strongly felt the influence of Emily Dickinson, with whom she has an avowed "elective" affinity. Mysticism is also an essential part of Del Serra's poetry, in which we hear echoes of Hildegard of Bingen, of the Sufi poets, of Sor Juana Inés de la Cruz (the subject of her play La Fenice), and of twentieh century Italian poet Margherita Guidacci, whose works Del Serra has collected and edited. Translating from Italian into English is an arduous job - since the grammatical and syntactical structures of the two languages are vastly different. Translating Maura Del Serra's poetry is not easy, since it is quite complex. In translation, considerations of sound and rhythm are essential, and some choices are dictated by a certain intuition that the sensitive translator learns to develop with time. Here, the translators have been as close as possible to the original, while at the same time creating poems in the target language. IN A THOUGHTFUL POETRY COLLECTION mixing dream and reality, Maura Del Serra holds our attention. The subject matter for this bilingual edition is quite varied, betraying a wide range of interests. There is a brightness, a sunlight, an optimism in her writing - despite her statement of "the brittle grass of my destiny" - that is immersed in a sense of eternity. The enduring force and the power of time, love, and maturity are ever present. Maura refers frequently to external nature: the golden sun, a calm sky, the sea, flowers and leaves, often with a strange and unexpected juxtaposition of disparate simple objects. She feels a fascination, a deep reverence for the universe of God filled with its illusions, its joys and torments, violence and mystery. She also reveals a marked interest in sounds - the songs of birds, laughs, raindrops, and footsteps. Her imagery is striking: she affirms that "La vita è penombra cangiante"; we are blind to the future. In addition, she writes about memories, "the blue waters of forgetfulness," where we search for sense in the ways of the world, while "twilight is wrinkling the sea".